Have you ever walked into the office or a get-together with friends or family and had someone say to you with great concern, “You really look tired today!” Although you may have been feeling pretty perky before that moment, suddenly you really DO feel tired and rundown. The words we speak to each other and the way we interpret them are powerful. And when addressing those with a chronic health condition, it’s important to carefully consider what to say, and perhaps more importantly, what NOT to say, to help the person feel his or her best. “My cousin had the same thing and was sick for months.” Sharing negative stories about someone with a similar diagnosis is a surefire way to bring the person’s spirits down. Instead, keep in mind that each person experiences health conditions differently, and focus on the positives the individual you’re speaking to has achieved. “If you’d only stopped smoking (or exercised; or followed a healthy diet; etc.) this wouldn’t have happened.” It’s impossible to know if the outcome might have been different if healthier choices had been made, and there’s no benefit to playing “what if.” Focus instead on providing the support and compassion the person needs today, and leave any feelings of judgment at the door. “Do you remember…?” Particular to those with dementia or other cognitive impairment, memory prompts such as this can add to the frustration and agitation already experienced. Sharing stories from the past as if they’re new is a great way to engage the person instead. 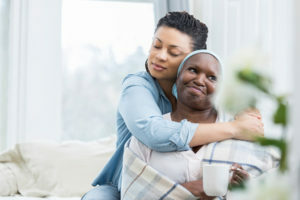 Your best bet is to allow the person the opportunity to share (or not to share) about his or her experience and feelings, hold the person’s hand if it’s welcome, provide a bright bouquet of flowers or another small gift or treat, and simply offer your warm, loving presence and support. For more care tips, or for hands-on assistance with professional care in the comfort of home, call on North River Home Care. We can provide the professional, caring assistance for those facing a health crisis that brings comfort and peace through companionship, help with meals and housework, transportation to medical appointments and procedures, running errands, and so much more. Call us at 781.659.1366 or contact us online to let us know how we can help.